Raku pottery is a ceramic practice deeply rooted in the traditions of the Japanese tea ceremony. In the early twentieth century, European and North American potters began investigating and experimenting with the techniques raku style of pottery explored. Since then it continues to develop and evolve in unique, exciting ways around the globe. Mike Gillan and Erin McArthur currently reside on the North Atlantic coast, dividing their time between St. John’s and Bell Island in Newfoundland & Labrador. The rich cultural life, rugged coastlines and wild natural beauty continue to be a source of inspiration. Each project starts with a piece of moist clay formed into a shape, either by hand or on the wheel, and dried. Once dried, it’s fired to bisque in an electric kiln and cooled. The pieces are then decorated with glaze and placed in a propane fueled outdoor kiln. We made one out of recycled oil drums and fire brick. The pieces are heated up once again to melt the glaze, usually to about 950C. Work is moved red-hot from the kiln into a bucket lined with sawdust, quickly covered to smother the flames and let the smoke and lack of air create the unusual finish. The process is called post fire reduction. After a short while, the piece is plunged into water, halting the reduction and holding whatever patterns have developed in the smoke and fire. When the piece is cool enough to handle, it is cleaned in warm soapy water, revealing beautiful and often surprising copper, aqua and white crackled surfaces. 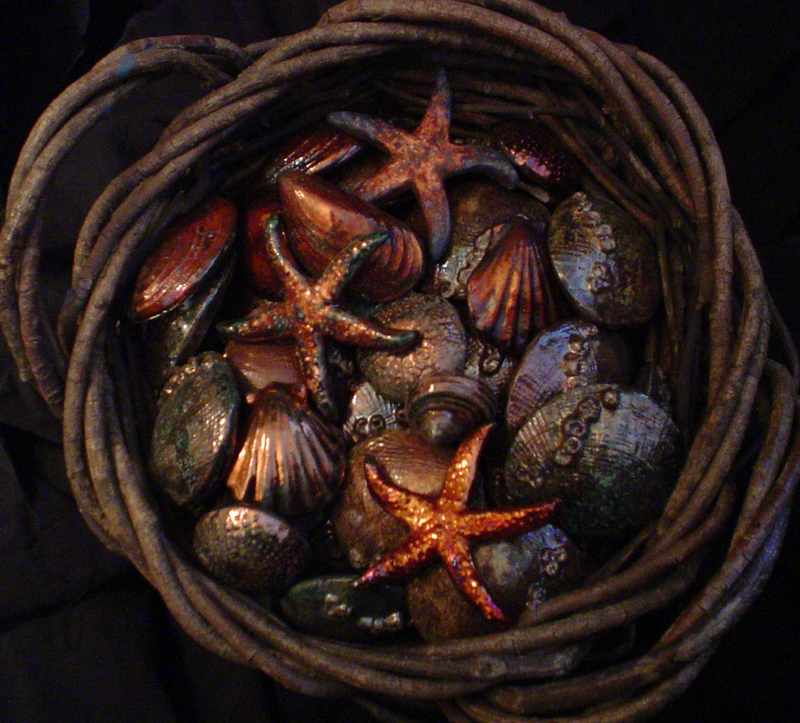 All items, from a mussel shell to a vase, are individually shaped and fired, making each piece one of a kind. This kind of firing is hot, intense and exciting. It can also involve more people; we usually have friends and others who happen by to help. There’s always food, and a scattered bit of wine once the firing is done.